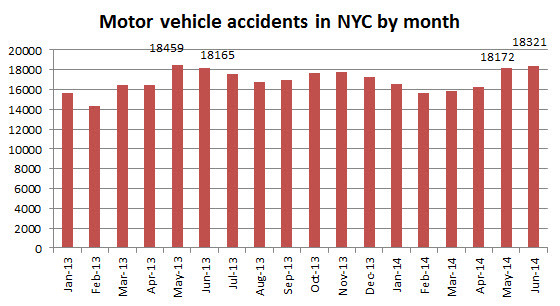 There were 18,321 motor vehicle accidents in New York City in June according to the recent statistics published by the NYPD. This is the highest number of accidents per month in one year and the second consecutive month that this number is above 18,000. A similar increase in vehicle accidents was also observed for the months of May and June last year. During these two months this number was also above 18,000. The total number of motor vehicle accidents for the first six months of 2014 is 8068 compared to 8828 in 2013, a decrease of 9.1%. 4950 people suffered personal injury in a motor vehicle accident last June compared to 4621 in May and 5046 in June 2014. During the first six months of the year 24,383 people suffered personal injury in a vehicle accident compared to 26,119 for the first six months of 2013, a decrease of 7%. For the first 6 months of 2014 there were 117 traffic fatalities compared to 121 in 2013. 20 people died in traffic accidents in June compared to 25 the previous month and 22 in June 2013. The number of motorist deaths was higher than usual for the last two months. 941 pedestrians suffered personal injury and 7 of them died in traffic accidents in June 2014 compared to respectively 882 and 9 the previous month and 966 and 11 in June 2013. Since the beginning of the year 5524 pedestrians were injured in auto accidents compared to 5931 for the same period of 2013, a decrease of 7%. 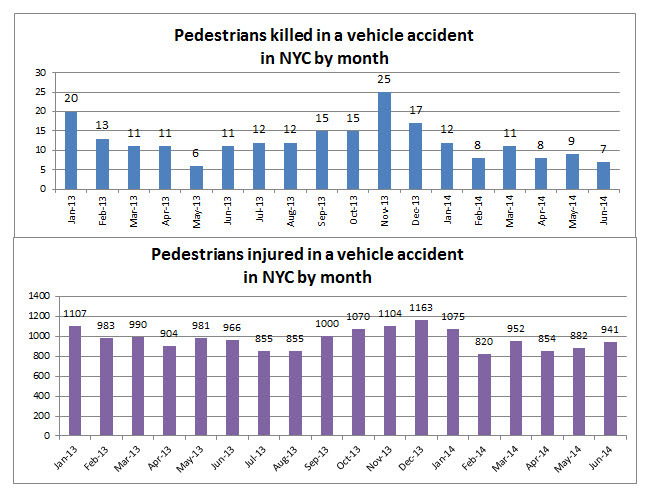 The number of pedestrian deaths for the first six months of this year is 55 compared to 72 in 2013, a decrease of 24%. The number of bicycle accidents decreased for the first six months of the year with 2022 accidents in 2014 compared to 2135 in 2013. The graph below clearly shows the increase of bicycle accidents during the summer months. 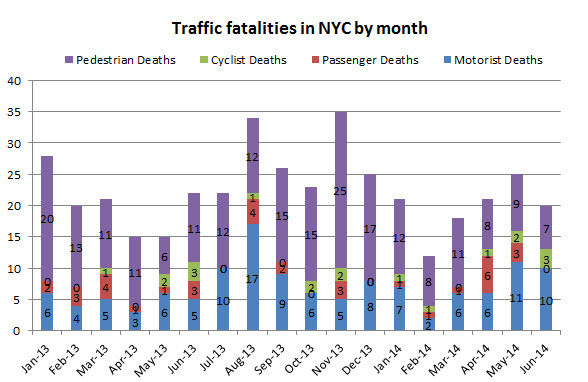 For the second consecutive year June is the deadliest month for cyclists. 3 people died in a bicycle accident last June, the same as in June 2013. 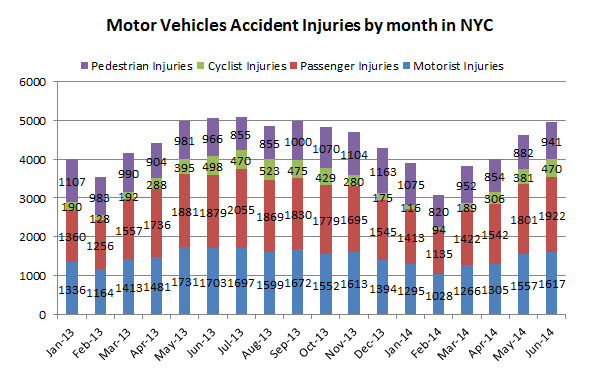 8 people died in a bike accident since the beginning of the year compare to 6 in 2013, an increase of 33%. 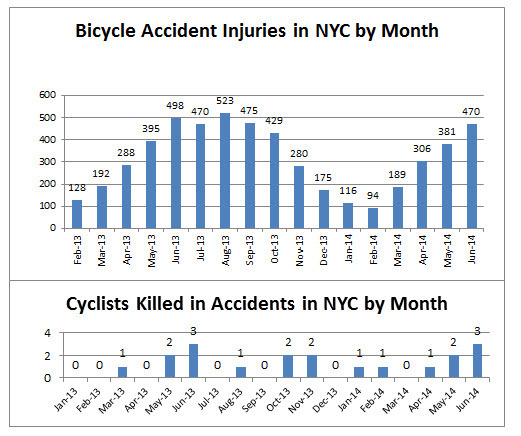 470 cyclists suffered personal injury in a bike accident in June 2014 compared to 381 in May and 498 in June 2013. For the first semester of 2014, 1556 cyclists were injured in an accident compared to 1691 in 2013, a decrease of 8%. 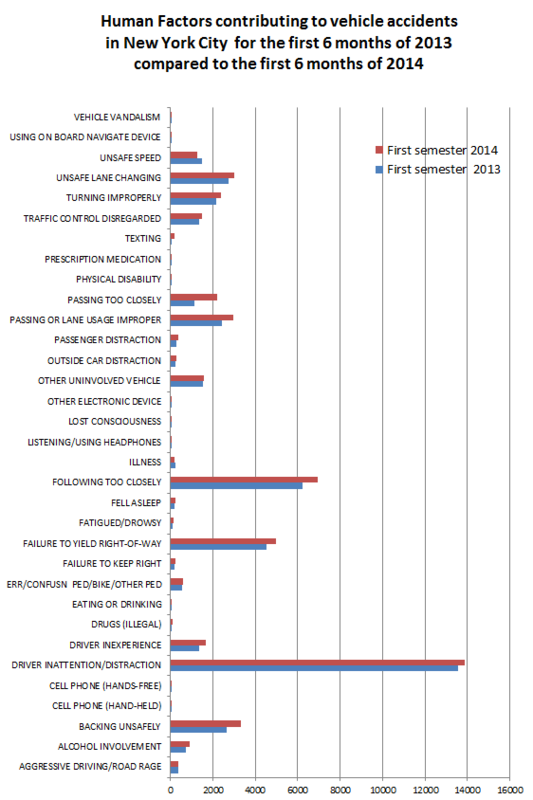 According to NYPD data, except for unsafe speed, drivers behavior seems to have worsened during the first semester of 2014 compared to the same period of 2013.